“Second wave” electric cars– Fiat 500es, Cadillac ELRs and even Tesla Model Ss– are starting to return to dealerships after their first owners are done leasing them. Now apparently those dealerships are wholesaling these vehicles for, like, nothing. Say it’s 2016 and you lease a 2016 Honda Civic for three years. 2019 comes around, your lease is up and the dealership takes the car back. If yours was an exceptionally clean and/or desirable-spec car, the dealer might stick it on their lot for a few weeks as certified pre-owned inventory. But it’s more likely that they’ll pack it up and ship it, along with all the other off-lease and trade-in cars they got that week, to a wholesale auction. These auctions can only be accessed by other car dealers. They’re the main source of inventory for basically every used car lot from decent independent outfits to sketchy buy-here pay-here dumps run by the mafia. This is how the car you traded in to a well-respected franchise dealer like a Herb Chambers in the northeast or Galpin Auto in the southwest end up at some potholed “Bob’s Auto Sales” lot in a dodgy neighborhood near the airport. So in 2013, people leased fully-electric Fiat 500es for three years. 2016 has come around and dealerships are getting these cars back. See what’s about to happen? Based on this little data sample we were shown this week, those dealerships are wholesaling low-mileage used EVs at insanely discounted rates. What you’re looking at here is a screengrab from a wholesale auction listing website. Specifically from Manheim auctions, which is one of (if not the) largest wholesale automotive auction house in America. They host unfathomably large auctions of used cars in warehouses every day of the week all over the country. When I worked as a supply chain manager at a small network of used car dealerships, I would pore over lists like this to try and identify trends and good deals. Then I’d go spend tens of thousands of dollars of borrowed money at Manheim events every week hoping I was right. A 500e is MSRP’d at around $30,000 now. Can’t imagine it was much less in 2013. Now according to this list, these cars are selling for $4,500 with just around 12,000 miles-per-year. That’s like an 80 percent value drop in three years of regular usage! Is an AMG car even that bad? Of course you, the average consumer, do not have access to these prices unless, you know, you know a guy. You’re going to have to pick one of these cars up from whatever bidder paid $5,000 for it at the auction and is now looking to make a profit. So what are these things selling for retail? Looks like around $11,000, which still seems ridiculously cheap for a three-year-old vehicles with below-average miles. If the dealers in this small smattering of AutoTrader listings I found in my cursory research paid the same prices we’re seeing in that Manheim screenshot, EVs are looking like god’s gift to used car dealers. What I’m saying is– a 100 percent markup is a lot. Wrenchman and auto writer (and apparent used car businessman) Bozi Tatarevic also shared screens of similar lists for a few other off-lease EVs. The Cadillac ELRs also appear to be trading at ridiculously reduced prices and yes, Tesla Model Ss too. In the interest of full disclosure; let’s acknowledge that this is a small sample. 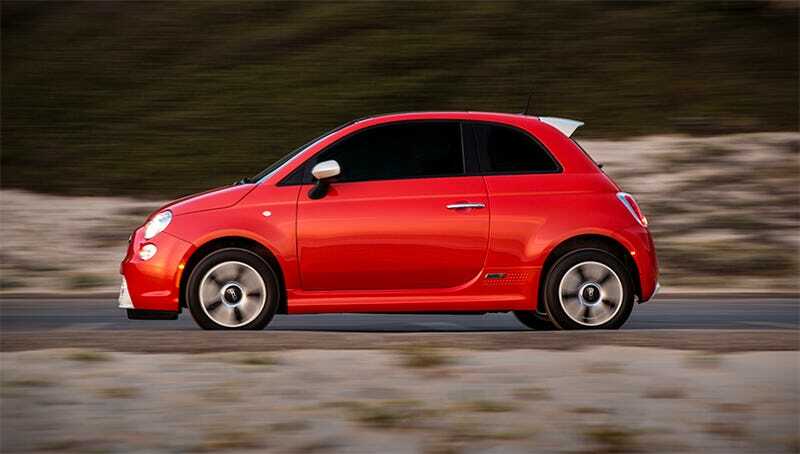 And of course, many fully electric vehicles including the Fiat 500e are only sold new and leased in a few states. And without seeing photos of the cars on these auction lists, who knows, maybe they were all in a fire or something. But I think it’s more likely that dealerships are just dumping these things into the secondhand marketplace, and the “used EV” industry is something you should be keeping your eye on as more of these come off-lease and into the wild.